As many of you know, I normally make a little update on the year there have gone and this year is no exceptions. It will not surprise many if I say Perfect Storms have had it best show year ever this year and it all end with a great show in Herning, but that I will tell later. 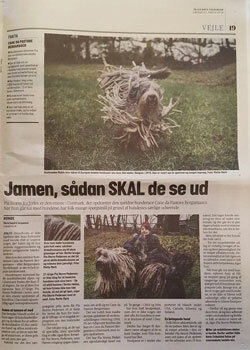 This year is maybe the year I have done most for Bergamasco in Denmark. Last year I started a little with Farmshow in Odense, This year we were at the Farmshow in Odense again, but also Big Horse and Dog day in Roskilde and it have been a big success. We have also been ambassador for Siccaro in there Campaign, for Splash dry coat, together with Danish camper union and we have been in our local newspaper. 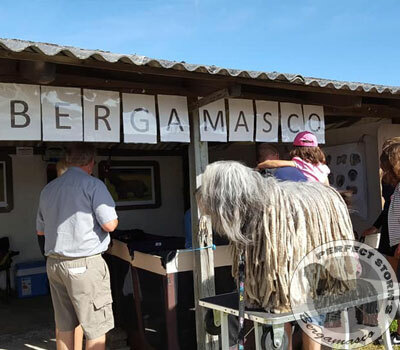 For me as the breed representative, for Bergamasco in Denmark, it is important to show and tell about Bergamasco as much as possible because the Danish people do not know them. This year Eccola gave birth to 3 puppies, all black, one male and 2 female. They have all get some great home in Portugal and UK. Once again we were at WDS witch this year were in Amsterdam, I have chosen that Eccola after 2 year break should enter even that she have had puppies, but she is always fast to recover after and I did not think there were anyone who notices it. Terk were in thought group of champion female and she got place as 4 best champion female. Eccola won best Veteran and beat the best male veteran and should enter the main ring later on a World Dog show, that is big for us, but that is not all she also won the World Veteran Winner 2018. Rubin won best male and also beat the veteran male and even that Rubin got beaten by the Best female, I were proud like hell, Best Male at a World Dog show and World Winner 2018!! This 2 World winner title mean the world for me, it is so big and I am so proud, to compeer a World winner title with anything people know it is like winning gold to a WM in other sports and who would not be proud of that. But after World dog show it were European dog show, and this year it were in Warszawa and I had enter all 3 dogs like the WDS. The day before EDS there were a Jubii show, with Eccola in the front as Best of Breed and we clean the table (as we say on Danish) and took 3 title out of 3 possible. European dog Show, Eccola won Best Veteran and is now Polish Champion and European Veteran Winner 2018. Terk won Best female and Rubin won best male and Best of Breed and both dogs is now Polish Champion and European winner 2018, but Terk also won her last CACIB and is now International champion. To compeer a European winner title with anything people know it is like winning gold to a EM in other sports and who would not be proud of that. However, we are not finish, our last show were at the double International dog show in Herning, I had enter Rubin. Rubin won Best of Breed both days, and got the Danish winner title and DKK winner 2018 but Sunday in the main ring for best dog in group 1. We got pick out between the 4 best dogs in group 1 and we got place as 3 best dog in all my show carrier there have only stood one Bergamasco in Denmark before Rubin and that were Perfect Storm’s Koda. We had been in the main ring so many many times without even getting look at but this time we got pick out and placed, there are so many top dog in group 1 so it is really a hard field and finally out hard worked got notices. Our Show year 2018 have really been super-duper fanatics a year I will look back on in many years and now we will work even hard and I look forward to it. All the many hours with coat, shower and drying has finally given paw (as we say on Danish) finally we get recognition for our work. But without my kids, my everything, my fantastic dogs would this not have happen and I am proud owner and proud of them. What will happen in 2019, no one knows, but i hope Perfect Storm’s 4 little will been born but only the time will tell. We will also be at some shows for sure, but I am not sure were. At last I will wish you all a merry Christmas and a happy new year, I hope to see some of you all in 2019! Rubin and I end the show year 2018 with fireworks. Saturday: Rubin got BOB and got very nice comments from the jugde. But our show did not finish there, we also have to go to the main ring and we got select together with 3 other dogs, to compete about the best dog in FCI group 1 and we got a 3 place!!! I am so proud and I could not wish for a better solution on our show year 2018!! The show year 2018 have been amazing, I am so proud of what we have accomplish together this year, we are a Perfect Team!! 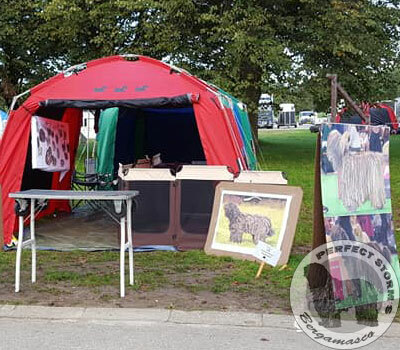 For me as a breed representative in Denmark for our fantastic breed, it is very important that I can came out and talk with the Danish people about the breed. 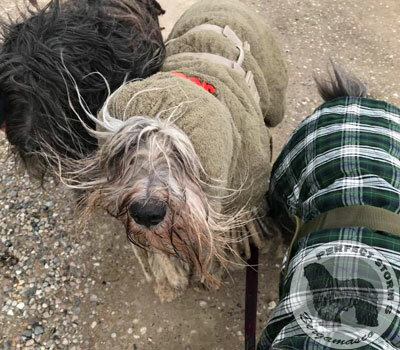 We all know that when you take your Bergamasco a new place or somewhere where people don’t know you, you will got a lot of questions about the coat and after that the breed. 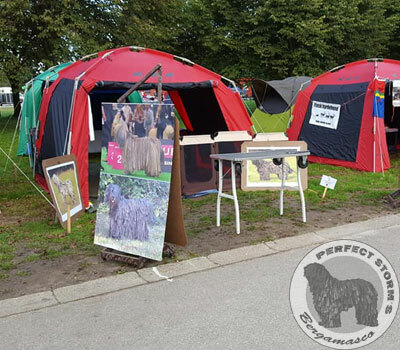 So I try to do what I can so the Danish people can get some Knowles about Bergamasco, here in Denmark there are 2 Bergamasco families there want to do that also, so we are doing it together. The Big Horse and Dog day is a weekend where people for the most are coming to see Horses, there are jumping, dressage, grooming and a lot of others competitions, but the last 2-3 year they try to get more dog people. This year’s there where more than 23 different breeds or Specials club with dogs and there where a very good dog programs to, with IPO work, Norse work, Agility, Dog show and a lot of others thing, but you could also try agility and dog massage with you own dog. Over a weekend like that, we talk with many, many people and say the same repeatedly. Trine and her family help me again this time, she have to girls there are very happy to help and to talk with people about the dogs and they are really a great help but also that people can see that kids can handle this breed. We always try to tell people about the coat, because they think it is too heavy, warm or that it is torture that they have this coat and I am sure that what we do can help this, because they then tell their neighbor and family at home to that this is normal. But we cannot caught all the people there don’t ask before they make a conclusion, Trines girls there are 7 years old where out and pee with Rubin and a woman come by and say that she should be ashamed, to torture a dog like that. Some people are mean but that is just not okay, I was so mad on the woman, when she told me that this there happen to her and Rubin, but the woman where long gone so I could not do something about it. Therefore, this is why I will keep on doing this as long as my dogs thinks this is fun. This year’s there where 22120 visitors over this 2 days and if just some of them can remember this breed our mission is complete. Maybe we will be back next years. We are now home for the show in Amsterdam, what a show, I still can believe it, but I am very very happy. But to come home to a silence house, because the puppy are home with their families, is really empty, but I know they have great families. I am looking forward to follow them in their new homes. Yeahh… I am not sure, where to start, it a big dream there come true. Skärviks Rubin Exc, best male, 2x CAC, CACIB, BOS and World Winner 2018!!!! Eccola Av Villrosebakken Exc, BOB Veteran and World Veteran Winner 2018!!!! Eccola have not been at a show in 2 years and 17 weeks ago she gave birth to 3 beautiful puppy’s, clean the table and got BOB Veteran and did her best in the main ring with maybe 70 dogs at BIS Veteran on the world dog show. I am so so happy to have 2 World winner titles and dog with me home and I think we nearly flight all the way home to Denmark. The dogs and I are very tried now, we have talked with many many people and the dogs where a selfie magnet. Trine and her girls and Dorte have been a great help, without your help the Bergamasco cannot be at the farm show. A big thank for all who have help we got with presentation of the dogs on the best way and our sponsor. Eccola have today giving birth to three puppies, 2 females one males and all black. They also made a video, look it here. The video you can see here, sorry it is also on Danish.